When you’re blasting though space at more than 98 percent of the speed of light, you may need driver’s insurance. Astronomers have discovered for the first time a rear-end collision between two high-speed knots of ejected matter from a super-massive black hole. This discovery was made while piecing together a time-lapse movie of a plasma jet blasted from a supermassive black hole inside a galaxy located 260 million light-years from Earth. he finding offers new insights into the behavior of “light-saber-like” jets that are so energized that they appear to zoom out of black holes at speeds several times the speed of light. This “superluminal” motion is an optical illusion due to the very fast real speed of the plasma, which is close to the universal maximum of the speed of light. Astronomers have discovered that the winds from supermassive black holes at the centre of galaxies blow outward in all directions, a suspected phenomenon that had been difficult to prove before now. 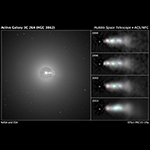 These new findings, by an international team of astrophysicists, were made possible by simultaneous observations of the luminous quasar PDS 456 with ESA’s XMM-Newton and NASA’s NuSTAR X-ray telescopes, and support the picture of black holes having a significant impact on star formation in their host galaxies. At the core of every massive galaxy in the Universe, including our own Milky Way, sits a supermassive black hole, with a mass some millions or billions of times that of our Sun. Some of these black holes are active, meaning that their intense gravitational pull causes matter to spiral inward, and at the same time part of that matter is cast away through powerful winds. NASA’s Nuclear Spectroscopic Telescope Array (NuSTAR) and ESA’s (European Space Agency) XMM-Newton telescope are showing that fierce winds from a supermassive black hole blow outward in all directions — a phenomenon that had been suspected, but difficult to prove until now.